Apple has implemented a new iBeacon specification and has begun certifying Bluetooth LE devices that utilize its iBeacon API under its Made For iPhone (MFi) program, according to a new report from Beekn. iBeacons are physical Bluetooth low-energy transmitters that use Apple’s iBeacon API to provide micro-location information to nearby apps and devices, with an accuracy range of a few feet. iBeacons are compatible with Apple’s iPhones and iPads, as well as other devices that use Bluetooth LE, and have thus far been used primarily by retailers and other venues to provide location-specific information. In order to use the iBeacon name, manufacturers now need to have their devices approved by Apple as part of the MFi program, similar to accessories and hardware for iOS devices. Using the term iBeacon requires manufacturers to meet specific criteria, which are only available after a non-disclosure agreement has been signed. The new specification gives Apple more control over the iBeacon trademark, which has previously been used by several different manufacturers for various Bluetooth LE devices since iBeacons were introduced in June of 2013. It is no longer possible to use the iBeacon brand without consent from Apple. Since being introduced last year, iBeacons have been used by multiple retailers and venues in order to enhance visitor experiences in retail outlets, sports arenas, and other locations. Apple has rolled out iBeacons to its own stores as well, providing location-based product information to customers. Still a crap idea in my opinion. I doubt I'll ever use it. It's going to be great for places like museums. I hate the fact that it's going to largely used for marketing, but when other knowledge based applications come into play it'll be great. Imagine cities and towns (like Boston) having their own tours with historical information available to you on the fly, museums that replace the antiquated audio tours with informative and dynamic interactive information right on your phone or tablet. There are many useful applications of iBeacon, lets just hope that it doesn't get drowned out by unimaginative ad agencies. iPhones having just 17% share of smart phone market worldwide, any company that wants to deploy iBeacon-like technology will look for Android customers first. Don't forget... market share is just what was sold this past quarter. You're completely ignoring installed base. There are a few hundred million iPhones out in the world right now. What's that? There are over a billion Android phones? Well... how many of those phones are complete garbage? Or more to the point... how many of those billion Android phones have Bluetooth LE ? Every iPhone since the 4S has Bluetooth LE... and that represents a TON of customers. Don't get hypnotized by Android's huge market share numbers. It's been proven that iPhone customers spend more money. App developers obviously realize this... and retailers who install iBeacons will too. So what if 5 Android phones get sold for every 1 iPhone? That doesn't matter when the 1 iPhone is actually more valuable. Fantastic! I thought I'd lost my oddly geometric hat, but as you can plainly see, it's right there hanging on the flattened tree! Uh, how do you get annoyed by something you have to opt into to use? If you don't have the app that corresponds to a given iBeacon there is NOTHING that happens on your phone. if the iBeacon transmitters are cheap enough, I can see a lot of use for this for all platforms. Walk into the kitchen and my phone could automagically start streaming directly to my kitchen stereo. keep one in pocket. Phone keeps unlocked while within a few feet radius of me. 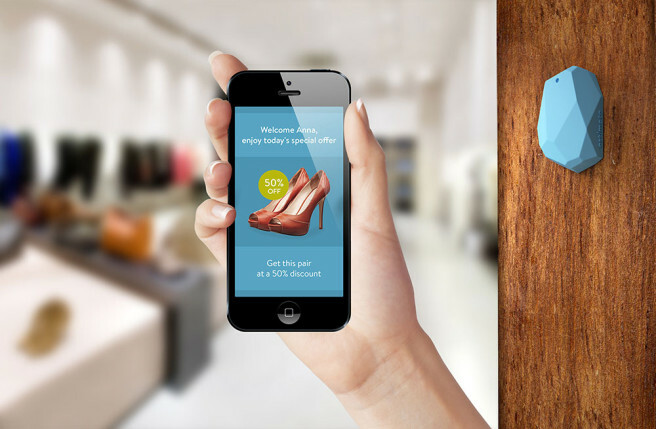 the concept behind iBeacon can have a lot of use. and yeah, for museums and the like its a great idea too. Back in 1999 I went to Alcatraz and took a guided walking tour with headsets. The headset was on a timed playback. you had to keep up with it. Or pause. you had to go in specific order to get the tour in correct order. You had to stay in one location long enough for the record to continue on to the next place cause you coldn't skip. But you'd need an iPhone or iPad to use it right? If so... somehow I don't see it taking off massively since it leaves out the many Android, Windows Phone and BlackBerry users out there. Technically I believe any device that has the Bluetooth 4.0 Lower Power standard can use iBeacon. iPhones having just 17% share of smart phone market worldwide, any company that wants to deploy iBeacon-like technology will look for Android customers first. It would be better for everyone if there was a standard for this (and obviously there will be one). How will "Made for iPhone" thing fit into this picture? Will companies have to deploy separate beacons for iPhone and everything else? Companies may start with "Made for iPhone", then deploy both iPhone and standard-based solutions but in the end there will be only a standard solution and all Apple fans will be begging Apple to switch to it (like they did with USB 3 and on many other occasions). Any device can recieve alerts from any iBeacon as long as they use Bluetooh LE. There is nothing in the iBeacon spec that makes it exclusive to iOS devices. All it requires is a bluetooth 4.0 compatible device and an app developed using apples guidelines for pairing and transferring of information. iBeacons are merely a trigger mechanism, the app does all the work, as long as the device knows what trigger to look for it'll work. That isn't to say there will be mass adoption amongst Android phones, but there is nothing stopping them from doing it other than simply writing the app. All that is required is the device maker support Apple's bluetooth mechanics. Naturally, that probably won't happen but not because Apple is withholding it. BlackBerry? Seriously? And developers are hesitant to currently develop for the iPhone because all those Windows Phone users as evidenced by app sales? This has got to be humor or sarcasm.